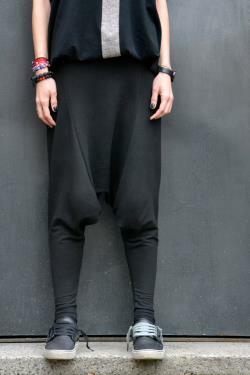 This gorgeous comfortable black loose drop crotch pants will be your. "must have " garment for the new season. So comfy and easy to wear at the same time a touch of elegance and style. Wear it with extravagant tunic, sneakers, favorite tee or top, or hoodie or sweater. Or what else do you have in mind will be always just perfect. Size (s, m, l, xl). Measurements (measurements of the body not of the garment). Waist 63-68 cm / 25"-27". Hips 88-93 cm / 35"-37". Waist 73-78 cm / 29"-31". Hips 98-103 cm / 39"-41". Waist 79-83 cm / 32"-33". Hips 104-108 cm / 42"- 43". Waist 85-90 cm / 34"-36". Hips 110cm - 116cm / 44"- 46". This model is wearing size s. Measure around natural waist with a measuring tape. Due to lower waist of the pants i'll add 2-3 inches to make the perfect fit. Using pants that fit well, measure from the crotch seam to the inside bottom. Machine wash cold / 30 degree. All parcels will be claimed low value. Take your smile with you.